On the play, Jimi opens with a Goldmeadow Stalwart, revealing a Kinsbaile Balloonist to keep the mana cost affordable I play an Island, then Ponder immediately. This lets me nab a Tideshaper Mystic, keeping an Island and Judge of Currents on top of my library. Next turn Jimi adds a Wizened Cenn, then turns the Stalwart sideways for 3. I play a Silvergill Douser and pass. Now turn 3, Jimi swings with both creatures for 5, dropping me to 12. She then keeps the pressure mounting with a Kithkin Greatheart and ends her turn. Next I drop my Judge of Currents and Tideshaper Mystic, but am still on the back foot. Over to Jimi, she sends the Stalwart and Greatheart into the red zone, threatening another 6 points of damage. I tap my Douser to give the Greatheart -3/-0 until end of turn, going up 1 life in the process thanks to the Judge of Currents. The Judge and my Mystic then gang-block the Greatheart to kill it, but Jimi’s Surge of Thoughtweft ensures I’ll be taking at least one casualty, and it’s my Judge. I go down to 10 life, then Jimi follows that up with a second Wizened Cenn, pulled right off her library from the Surge. Belatedly, I deploy my Merrow Reejerey and pass. The beats increase on turn 5, as Jimi swings for 8 now with the help of the second Cenn. I use the Douser on the Greatheart and gang-block it again, killing it this time, but still am left at 6. Jimi replaces her loss with a Kinsbaile Balloonist and ends turn. Desperate for defense, I summon an Avian Changeling and Stonybrook Angler. The Changeling draws an answering Oblivion Ring next turn, and death is only an alpha strike away. The deck simply never got going. This time it’s my choice to open the game, and I begin with an Island and Tideshaper Mystic while Jimi summons a Goldmeadow Dodger off of her Plains. I follow with a Silvergill Adept, revealing a second Tideshaper Mystic from hand. Depite all that, it’s Jimi who lands first blood as she sends the Dodger in for 1, but has no other plan and passes. I miss my first land drop on turn 3, and am stuck with a pair of Islands. Fortunately, the Mystic is there to turn one into a Plains, letting me play a Judge of Currents. I then attack for 2 with the Adept, putting Jimi down to 18 and me up to 20 thanks to the lifegain from the Judge. Jimi simply puts me down to 19 again once her turn rolls around, then adds a Cenn’s Heir and calls it good. Now turn 4, I summon a Merrow Reejerey, immediately swinging with everything for 7 (and going up another 3 life). This puts Jimi down to 11, with me having double that. Jimi wastes little time in Oblivion Ringing the Reejery, the fires back with both of her creatures for 3. Next turn I attack with the side again, going back up to 22 as Jimi falls to 7. I then follow with a Stonybrook Angler and Tideshaper Mystic. Alas for Jimi, her turn is a blank. With the shoe firmly on the other foot, I waste little time in sending in the troops on turn 6, though this time I hold back the Judge as a precaution. Jimi’s ready with a double barrage of Surge of Thoughtweft, but I respond to the second with a Whirlpool Whelm to bounce Cenn’s Heir. Though I lose the clash, I do get a lovely consolation prize- an Oblivion Ring of my own atop the library. With her blockers pumped up, Jimi’s Dodger kills my Angler, but she goes down to 3 as I’m up at 26. Still, she manages to stabilise with an Avian Changeling alongside the recast Cenn’s Heir. Next turn I send in the Adept and pair of Mystics. Her Changeling blocks a Mystic and kills it, while the Heir blocks another and trades. She then shoves the Dodger in front of the Adept, but the timely intervention of the Silvergill Douser prevents this from being a trade. With the board now cleaned up a bit, Jimi counterattacks with the Changeling for 2 before adding a Changeling Hero, championing the Avian. Now turn 8, I Oblivion Ring the Hero, unwilling to give Jimi a lifelinker. This has the upside, however, of returning the Avian to play. Back to Jimi, she plays a Kithkin Greatheart, then follows with a Thoughtweft Trio (championing the Greatheart). With that, we’re in a bit of a stalemate. She attacks for another 2 in the sky, and I’m down to 29. Next turn I play Summon the School, putting a pair of 1/1 Merfolk tokens into play before passing. Jimi adds a Knight of Meadowgrain, then sends in the Avian. This time I blank it with the Douser, going up another point of life from the Judge. At the end of turn, I tap a further four Merfolk to return Summon the School to hand, and go up a further four life in the process to end at 34. Again on turn 10 I simply Summon the School and pass, needing to assemble an army to deal with the Thoughtweft Trio and happy to let my deck’s engine begin firing. Jimi adds a Kithkin Greatheart. At the end of the turn, I return Summon the School and throw in a pointless activation of the Douser to go up another 5 life. Next turn, I simply Summon the School again. Jimi, who’s been reduced to playing off the top of her library now for several turns, has nothing and passes. I fire off again at the end of her turn, tapping four Merfolk to return Summon the School to hand, triggering the Douser, and going up an other 5 life. Things get even uglier on turn 12, after I draw (and immediately play) a second Judge of Currents. Now my nifty little end-of-turn trick will be netting me a whopping 10 life per turn, and it’s just a matter of time to find a way to close Jimi out. Seeing an answer in my Streambed Aquitects, I lay off the School for a turn and summon them instead. As for Jimi, she plays a Plains and passes. Next turn I add the next piece of my endgame solution with a Stonybrook Angler, then Summon the School for a lark. At the end of Jimi’s (blank) turn, I trigger the engine again and have now climbed to 54 life. The final piece of the close-out drops on turn 14: Wanderwine Prophets (championing one of my horde of 1/1 Merfolk tokens). All Jimi can do is make a sour face and play a Wizened Cenn. Next turn I make my move. I begin by using the Aquitects to give the Prophets +1/+1 and islandwalk, going up to 56 life. I then use the Stonybrook Angler to untap the Aquitects (+2 life), retriggering them to turn one of Jimi’s Plains into a very fatal Island (+2 life). I then swing for the game with the Prophets, though Jimi answers with a Pollen Lullaby. We tie on the clash, so all it does is buy her a turn. For good measure, I then Summon the School and end my turn. Jimi draws her next card, and finding nothing she concedes. Jimi- now looking rather grim-faced, opens with a Goldmeadow Harrier, while I simply drop an Island and pass. Next turn, she adds a Knight of Meadowgrain after drawing first blood, while I answer with a creature of my own, the Silvergill Adept (revealing a Silvergill Douser). Now turn 3, Jimi swings in with the Knight for 2 to take me down to 17, going up to 22 herself thanks to its lifelink. Back to me, I then play the Douser to complete my matching Silvergill set. Next turn she goes big with a Wizened Cenn, letting her attack in for 5 with both beaters. Down to 12 life and not liking the pace of the game, I summon a Drowner of Secrets. Although my Douser is able to blank her Knight on turn 5, I still take 4 from her all-in swing. At the end of her turn, I tap my remaining two Merfolk to mill Jimi for 2, hoping to get something going with the alternate path to victory. I then Oblivion Ring her Wizened Cenn, then pass after laying down a useless Springleaf Drum. For her part, Jimi then plays a pair of Kithkin Greathearts. I mill her for 3 by tapping my side after it’s clear she’s not going to attack, then play an Avian Changeling once my turn arrives. Jimi sends in the side on turn 7. I block a Greatheart with my Drowner and the Knight with my Avian Changeling, using the Douser to blank the Knight’s power. Jimi reponds with a two Surges of Thoughtweft, turning combat right around in her favour. Her Knight still has 0 power but survives the engagement rather than perishing, while my Drowner dies (though I mill with all my untapped Merfolk on the way out). Back to me, I try and rebuild with a Summon the School and second Silvergill Douser, but Jimi keeps momentum on her side with an answering Cloudgoat Ranger. At the end of turn, I tap Merfolk to return Summon the School to hand, but have to use my turn Oblivion Ringing the Giant instead. Jimi finally finds victory on turn 9 when she alpha strikes behind a Surge of Thoughtweft and Shields of Velis Vel. This wipes my board except for the Changeling, and I scoop after my next draw. We’ve reviewed a very small number of decks that have drawn the comparison to a “glass cannon.” If you’ve never heard the term before, this is something that can deal out a ton of damage, but is very vulnerable to falling beneath damage itself. If you’ve played World of Warcraft, you’re probably thinking “Mage” right about now. By the same token, if you’re a Legacy player, perhaps “Belcher” is the first thought that comes to mind. Merrow Riverways is entirely deserving to be ranked amongst these. The second game we played was very impressive with the engine that the deck was able to accomplish, but even more fun (for me) was our pregame friendly. I had out the pair of Judges of Currents alongside a ton of Merfolk, including the Fallowsage, Rejeerey, and a Drowner of Secrets. With a Merrow Commerce in play, I was tapping out to mill the bejeezus out of Jimi’s deck, gaining a ton of life, free cards, and doing it all over again on her turn. There aren’t too many times the word “griefer” comes to mind, but from Jimi’s perspective, two of the games we played were nearly outright unfair. Of course, that left the other two, and this is where the balance comes in. Cobble together the right cards, and Riverways is a brutal engine. If you don’t, however, it’s a loose pile of junk. This deck is the poster child for the “feast or famine” style of deckbuilding we’ve identified before. Either it all comes together and you crush your opponent, or nothing seems to link up properly and you’re chumping a couple extra turns before dying. Merrow Riverways offers you precious little middle ground. But oh what a ride! 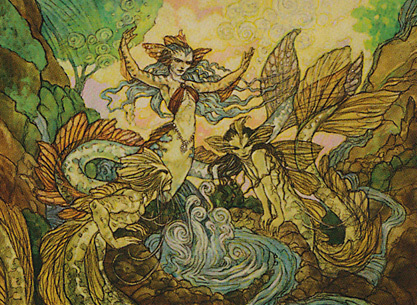 It’s hard to say what distinguishes this deck from Elvish Predation, which felt like it bogged down in bookkeeping, but the Merfolk came together with a fluid grace that the Elves could only stand in envy of. Put another way, it seemed just on the right side of the divide between “intricate” and “excessive.” That said, this is absolutely a deck aimed at a very narrow segment of player, and if chaining together onboard effects isn’t for you, or you prefer more interaction at the table, you would be well-advised to give this one a miss. 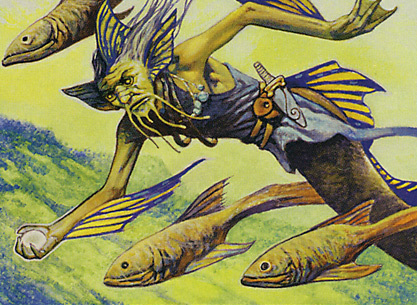 Overall, Lorwyn promised us tricky Merfolk, and this collection of 60 cards delivers. I think your estimation of the deck is off. This is a control deck. You have 2 Harpoon Snipers, 2 Stonybrook Anglers, 3 Silvergill Dousers, 3 Oblivion Rings…the deck is loaded with defensive cards. If you don’t draw your combo pieces, your plan is to stall the game and gain incremental advantage to grind out a win. He’s right, Jimi had a lot of luck to draw that cards. I have played TONS of games between Lorwyn precons, and the 70-80% of the matches were as the second of yours. Kithkin militia is not a bad deck, but it has the same flaws as other weenies decks; but on the other side, without mass removal, Merrow riverways is a powerful control/mill/combo deck and superior to most precon decks. Until you get the pieces, stall the game, you have many ways to do it consistently, and then go for the win. It may seem that i’m not being objective, but i speak after playing dozens of times with and against this deck unmodified, and for me it’s 5/5. Did this deck run in the championship yet? If not, I’m now looking forward to that. Curious to see how this would do against the elf deck also. I have been playing this one against elvish predation and it has lost badly 3 out of 3. I see the complexity and initially i enjoyed the extra thinking time involved in setting up trigger combos with the tapping and untapping combos, but it never pays off for the time invested. what is most frustrating is that even on turns where i am able to manipulate a major three card draw, i never get anything I’m excited about. Oh look… another weak 2/2 that has to tap itself to do something fairly usless like cause opponent to deck discard. It is major work even getting these merfolk strong enough to attack or block. Other cards that tap to give islandwalk and +1/+1 are also pretty weak. Too often the trade off forvtapping the creature is not worth the benefit. If this is indeed a rubic’s cube that needs to be solved, i haven’t solved it. I find the artifacts that tap your creatures for an extra mana to be annoying, especially multiples. Once, i got a flying creature out, and managed to fly over the elves, but it pales when ‘elvish predation’ is setting up a board with 8 elves, all 3/3 or 3/4, making tokens every turn, getting out a legendary commander at 5/5 that forces me to discard every turn. Plus,that deck also has a nasty 3/3 with death touch for two mana! Other unbalanced cards between the two decks are examples like elvish predation getting an elves card that kills creatures by discarding an elf, causing -x/-x that equals the elves in play. That one alone decimated my board. Meanwhie, merrow riverways gets a similar creature that only knocks down the attack -x/-0. What? Whoppee! Never used it once. I understand why elvish predation sells for a premium on ebay. It is nasty! I will keep at this matchup for a while to try for a win with merrow riverways but i think merrow needs tinkering to have a chance in this duel. What should go and what should stay? Thinking about more oblivion rings, more birds, less usless tappers that never get to use their ability because they need to chump block.